Appropriately enough since the Tour de Fleece was in full swing at the time, my much-drooled-for copy of The Fleece and Fiber Sourcebook arrived a couple of weeks ago. This is just a beautiful, beautiful book. Even if you don't work with fiber it's more than satisfying as an up-close examination of the huge genetic variety within the world of one particular animal, and a celebration of how human beings around the world have been able to utilize their local resources. The cover gives you a clue of what's inside. 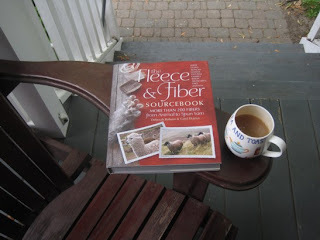 Not just the history and use of each animal and its fiber but knitted and woven swatches, loops of spun and plied fiber, and samples of the actual fleece both raw and clean, for every single breed the authors could find. All photographed in the most peaceful, lovely way over large pieces of solid-colour fabric set onto a wooden surface. Swoon.